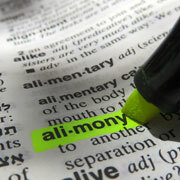 The Tax Definition of "Alimony"
The payment is in cash (or a cash equivalent such as a check or money order). The payment is received by a spouse or ex-spouse (or on behalf of the individual) under a divorce or separation agreement. The agreement does not designate the payment as something other than alimony, such as child support. The spouses who are legally separated under a decree are not members of the same household at the time the payment is made. There is no liability to make any payment (or a substitute for a payment) following the death of the recipient spouse. The spouses did not file a joint tax return with each other for the year of the payment. On the other hand, other amounts required to be paid under the agreement, such as child support and property settlements, can't be deducted by the paying party and are tax-free to the person receiving them. And voluntary payments that are not made under the terms of a divorce or separation agreement cannot be treated as deductible alimony. Case #1. An officer with the Los Angeles Police Department divorced his spouse in 1997. Based on the community property laws in California, the divorce court awarded the ex-spouse half of the police officer's pension. Although he was eligible to retire and receive benefits, the husband continued working for the police department. Consequently, the court ordered the police officer to pay his ex-spouse the present value of her share of the pension (determined to be more than $25,000 a year). In 2000, he paid this amount and deducted it as alimony on his federal tax return. To qualify as deductible alimony under the tax law, payments must cease upon the recipient's death (see right-hand box). In this case, the payments were to continue to his former spouse's estate if she died while the officer was still employed by the Los Angeles Police Department. Case #2. A serviceman with the U.S. Navy divorced his spouse in 1993. The divorce decree required the serviceman to pay one-quarter of his naval retirement pay to his ex-spouse under the Uniformed Services Former Spouses' Protection Act. He was also ordered to make child support payments and help pay medical and dental costs for each child. When he retired from the Navy in 2000, the taxpayer began receiving retirement pay, but did not make any payments to his former-spouse as set forth in the divorce decree. However, after being compelled to do so by court order, he eventually made payments of $6,074 in 2002, some of which were for his children's uninsured dental expenses. The serviceman then deducted the entire amount as alimony on his federal tax return. The IRS argued these payments did not qualify as alimony because part of it involved child support and the remaining portion was a property settlement. But the Tax Court disagreed. Absent other terms in the agreement, the Court ruled that a portion of the payments constitute alimony if they would terminate upon the ex-spouse's death. In this case, the retirement benefits halt upon the death of the first spouse to die, so the serviceman would not be liable for payments to his ex-spouse's estate. The payments also met the other tax law requirements for alimony. The two cases point out the need to obtain professional tax advice when a divorce or separation agreement is being created. By planning ahead, both parties may come out ahead.